We are very sad to know that Professor Dhriti K. Lahiri Choudhury has passed away. 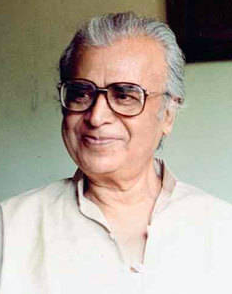 He died on Friday morning in Calcutta. 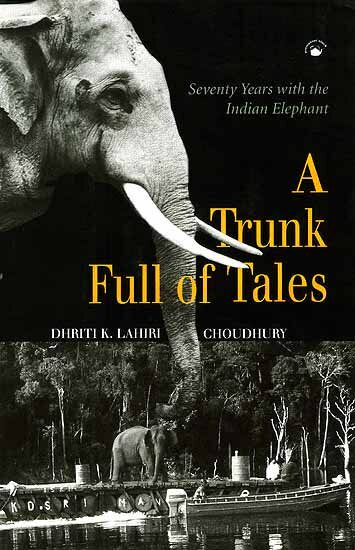 Dr Lahiri Choudhury, born in 1931, did many things: with a PhD from Leeds in English Literature, he combined his work with elephants with teaching at Rabindra Bharati University. He was a member of the IUCN elephant group and of Project Elephant. It was a joy for us to publish his Trunk Full of Tales: Seventy Years with the Indian Elephant -- the editorial sessions involved long, old-style sessions of story-telling which should have been around a campfire. He would tell of his many hair-raising journeys across Assam, Meghalaya, Bengal, the Barak Valley and elsewhere, in search of rogue elephants or on arduous elephant surveys, when the evenings always began with emptying blood-soaked boots of leeches; he would talk lovingly of the elephants in his childhood home in Mymensingh -- now in Bangladesh -- their names and foibles; and of drinking elephant milk as a child. We cannot but think of him, wherever he is now, sheltered by a wise, gentle gathering of elephants, welcoming one of their own. I am not given to hyperbole, but having read your book twice now, I cannot but conclude that it is a masterpiece. Every sentence, every paragraph and every section conveys years of research of the deepest, most sensitive, and most acute kind. Your work with sources is a master class in – to use a tired phrase – “reading against the grain”. The reader can also watch you grapple with wave upon wave of historiography – apparently hostile and irreconcilable trends locked for years in shrill debate – which you deftly knit together into a new coherence. 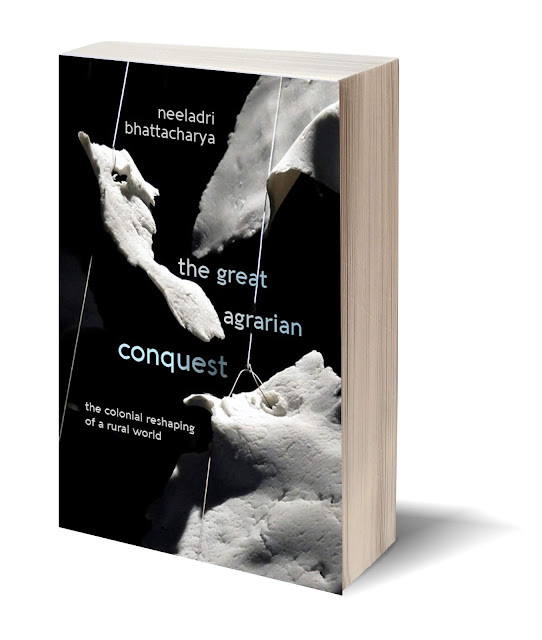 No historian of South Asia can ever use the word “agrarian” unreflexively again after reading this book; and I am confident its impact will be felt beyond the remit of South Asian history. So, my questions here come from a place of deep admiration and collegiality. The first question has to do with historiography. While you acknowledge the impact of Marxisms and the post-colonial turn upon the shaping of this book, it seems to me that shades of the so-called “Cambridge School” emerge again and again. There is the large theme of the “sedenterisation” of mobile peoples, which both Christopher Bayly and David Washbrook have written about; there is also the image of the colonial state’s policies being “buckled, fractured or broken” in the face of overt or covert resistance. A very early work of the “School” described how the local knowledges that had accrued were flattened out by policy-makers at higher levels – a theme you also pursue. Admittedly you are adding rich and complex detail to these themes, and you add layers by regarding the “accrual of knowledge” as a project imbricated in power, but these strands nonetheless appear recurrently through the book. Could you elaborate on whether, and to what extent, the “School” has been an influence? Thanks Joya for your appreciative words and probing questions. There is something peculiarly interesting about a Cambridge historian interrogating a JNU historian. When I was a student at JNU in the 1970s, such a conversation would have been difficult to imagine. Historians of Cambridge and JNU, at that time, represented two hostile camps, each defining its identity in opposition to the other. So I am really happy that we are having this dialogue. You ask me about my relationship to the “Cambridge School”. I do not think there is any longer a set of internally coherent ideas that now defines “the Cambridge School”. The homogeneity that could be attributed to the school in the 1970s slowly crumbled over the subsequent decades. Historians of Cambridge now working on South Asia think in different ways, frame their arguments diversely. So in talking of the Cambridge School we can only refer to the early phase inaugurated by its foundational text, Locality, Province and Nation: Essays on Indian Politics 1870 to 1940, edited by John Gallagher, Gordon Johnson, and Anil Seal. I have always thought that the historians associated with the Cambridge School of that time raised many important questions but framed their arguments in problematic ways. And framing does matter. Seemingly similar questions posed within different frames have distinct meanings. The arguments that flow from such posing of questions are not the same. They may in fact be radically opposed. For instance, the notion of an all-powerful imperial state carrying through its policies with irresistible ease has been widely critiqued, but within different frames. Cambridge historians, as you say, spoke of imperial power being “hobbled at every turn”, of imperial policies being “buckled continuously by local conditions”, fractured and broken. There were others, beyond Cambridge, like Robert Eric Frykenberg in the US, who similarly referred to imperial power confronting processes of fragmentation and disintegration, with local power holders in villages resisting centralisation, silently corroding the imperial structure. In such formulations there is a shared notion of imperial power being internally hollow, diminished from inside, and therefore ineffective in implementing its will. It is almost as if the category imperial is empty. This is an argument suggesting a weak state, feeble power. In it the heterogeneity of voices within officialdom and inner tensions between officials are read as signs of an absent authority, or crippled authority. My exploration of the inner tensions and conflicts within colonial discourse is different. My argument is, in fact, about a strong state. We should not assume that strong power is necessarily monological, free of inner conflicts or self-doubt; or that a multivocal discourse is feeble. In developing my argument I was carrying on a conversation not so much with the Cambridge School but with one influential strand in post-colonial studies on power and discourse that developed in the 1980s and ’90s. Reacting against the Foucauldian notion of an all-pervasive panoptican power – one that governs and shapes all thought and action within society – many historians at that time went on to explore the internal tensions and conflicts within imperial discourse, its inner ambiguities and ambivalences. At one level, this move was immensely productive, opening up new fields of research, encouraging wide-ranging studies on colonial discourse and power. But at another level this turn became tendentious, fetishising the idea of “ambivalence” and “ambiguity”. My effort has been to build on what I have found productive within this particular discursive turn, and to critique what I thought was problematic. The conceptual underpinning of my argument about discourses of colonial power in the book is twofold. First, to quote a couple of sentences in the book, I suggest that “Dissonance does not mean paralysing discord, ambiguities do not freeze decision and conflicts of opinion do not block the possibility of confident action.” So the point to explore is “how such differences are articulated, negotiated, and transcended, and [how] the authority of imperium is expressed.” Second, I see these confrontations of conflicting ideas, such negotiations of difference, as productive. They provide the inner dynamic of discourse; they explain mutations in thinking, modifications in policy, and changes in the way power is exercised. To explore this dialogic is to discover the inner vitality of power. What about the argument of sedentarisation? As you know, sedentarisation is not a theme that is new in Indian history. Neither Chris Bayly, nor David Washbrook – whose works I greatly admire – nor I, are the first to talk about it. The question is, how do we frame this argument and see its spatial and temporal logic. Many historians of ancient Indian history – framing their argument within Marxist teleologies – have traced the history of the settling of nomads to the later Vedic period, when peasant agriculture expanded in the river valleys and plains, iron technology was discovered, agrarian surplus produced, caste order established, and states founded. Subsequent history was read as an unfolding of this settled agrarian economy. Within this transition narrative, as I argue in my book, history moves inexorably forward towards settled peasant society. Pastoralists and forest dwellers appear as vestiges of the past – as not worth the historian’s concern. Only in recent decades do we find the focus turning to pastoralists and nomads. My effort in the book has been to critique this linear teleology, to suggest that the early expansion of settled peasant agriculture happened primarily within the deltaic regions, in riverine belts, and on alluvial soils. Over the vast rural landscape beyond this zone of settled agriculture we see the pastoralists with their herds, “tribal” communities living on forest produce, shifting agriculturists engaged in slash and burn, and communities engaged simultaneously in a diverse range of livelihood forms. We can discover the inner logic of these forms, and their intertwined lives, only when we stop seeing them as vestiges of the past. Chris Bayly wrote of the process of sedentarisation of nomads in the late eighteenth and early nineteenth centuries. His thesis is important and I have engaged with it elsewhere. But I have a difficulty with his framing narrative. He counterposed his argument of the peasantisation of nomads to the nationalist argument about proletarianisation of peasants under colonial rule. This framing may be interestingly provocative but it is also problematic. We cannot replace one universalist argument by another. Not all peasants were proletarianised under colonialism, nor all nomads settled. I have argued elsewhere that Bayly shares the premises of the argument he opposes. Both these opposed theses share the common assumption that vulnerable social groups succumb to the irresistible and all-powerful forces of commercialisation and agrarian expansion. Unable to resist, peasants, according to one thesis, become paupers; according to the other, nomads become peasants. What I have tried to explore – not so much in this book but elsewhere – are the diverse ways in which pastoralists and nomads negotiate their ways through changing times, creating spaces of resistance and manoeuvre, even as they feel the pressures of the agrarian conquest. The purpose of my study in this book is not so much the objective processes of sedentarisation as the creation of an agrarian imaginary, by which I mean the constitution of a regime of categories within which settled peasant cultivation is normalised and the agrarian comes to be seen as the universal rural. Such an imagination, and the categories and terms that constitute it, delegitimate alternative forms of livelihood and ways of being. It is in this sense, I suggest, that the agrarian conquest is a deep conquest: it transforms the way in which we look at the rural, it refigures the frames that structure our vision of all that lies beyond the city. This wide-ranging conquest, this radical delegitimation of plural ways of life, this normalisation of the settled agrarian, has implications that the category “sedentarisation” cannot capture. You describe the colonial state as an anxious and internally divided entity that was able, on occasion, to work authoritatively and aggressively from above, at other times working “by stealth”: apparently changing nothing, but, by “preserving” the past, in fact changing everything. This is another brilliant insight which uses historical anthropology to great effect. You mention the consolidation by that state of patriarchy and caste in “villages” – yet, changing trends in women’s work and status, and the fate of the lower castes, are not analysed with the same deep attention you devote to other subjects. I wonder why. In this book I don’t focus on rural work – whether of women or men, or of the various caste groups. Here my focus is slightly different. As for women, I explore how the great agrarian conquest impinges on their lives in several distinct ways. I suggest that colonial classificatory practices strengthened the power of male brotherhoods in the villages: tenurial categorisation recognised only males as proprietors, the codification of custom reaffirmed the power of male lineages and the rights of agnates, and the constitution of village panchayats consolidated the juridical power of the male proprietary body. But I also show the ways in which wives and daughters, widows and lovers, did not inhabit a pre-scripted legal habitus whose lines they had to follow unquestioningly. They questioned the new definition of rights, filed suits, and fought cases. When we move from the practices of codification to the activities of courtrooms, we see how judges had to continuously reinterpret codes and rework custom. So, my focus in this book is on the changing regime of categories and codes, customs and laws, which impacted the lives of rural women. Their working lives have to be the subject of a different book. The changes I track had profound implication for the “lower castes”. Tenurial classification, premised on evolutionary theories of society, traced the lineage of proprietary brotherhoods, displacing the rights of those seen as non-proprietors. Rights to soil were believed to be defined by relationships of blood, with descendants of the original founder constituting the coparcenary community. Those who failed to assert such a mythical ancestry could not be members of the brotherhood – their claims could not be recognised in the record-of-rights. The Land Alienation Act of 1900 went further, debarring the sale of land to non-agricultural castes. Categorised as non-agriculturist, denied the right to land, excluded from the coparcenary community, the position of the “lower castes” became even more precarious as common lands disappeared, in part taken over by the colonial state, in part partitioned and appropriated by the khewatdars of villages. In this sense, the story of the consolidation of the village coparcenary communities that I track through several chapters is intimately connected to the fate of the “lower castes”. I agree that their everyday lives need to be explored in depth, but that again means writing a different book. The conquest of the commons, the scrubs, and pastoral land is a central theme of the book, and one of its great contributions is its analysis of how rights (and communities) in these regions often agglomerated around the construction of wells, the building of bunds, and the ownership of cattle. (Here, your shifting of the gaze from the forest to the scrub is very welcome.) But again, I wonder about the relations of power within communities you describe as “nomadic” or “tribal” – particularly the role of women and girls – in societies structured around the training of boys and men to loot and steal. You mention the violence of nomadic groups on neighbouring habitations but say little about their internal fractures and violence. I wonder if I could push you a little on that issue? Well yes, I do not say much about the internal fractures within nomadic societies. That again is to do with the way I define the object of my study in the ninth chapter, which is the one you are referring to. As you know, the central focus of my discussion there is not so much the nomads as the spaces they inhabited. I am looking at grasslands and scrublands – the bãrs in particular – that the British wanted to colonise. They saw these as wild and open spaces belonging to nature, unexplored and unexploited, waiting to be cultivated. But no project of colonisation could proceed without an encounter with the history of the place and the people who inhabited it. For this reason I discuss the nomads who inhabited the bãrs – the vast highlands of western Punjab – and the politics of raids and counter-raids through which nomadic zones were demarcated; and I then explore how pastoral landscapes were reterritorialised in the second half of the nineteenth century. Colonial officials went around surveying the bãrs, mapping the terrain, settling the nomads, regulating their movements, enumerating them, subjecting them to a new fiscal regime, and finally creating the canal colonies. I explore the history of diverse micro encounters – between nomads and officials, villagers and surveyors – that shaped the way colonisation could proceed. I fully recognise the importance of exploring the internal structure of nomadic societies, but, once again, I’d say that that is a slightly different project. I have written earlier on pastoralists in a colonial world and hope to publish more on nomadic pastoral societies, on the diversity of their social forms and life experiences. Turning away from the book, you are celebrated as an inspirational, dedicated, and unselfish teacher. What animated your drive to teach? 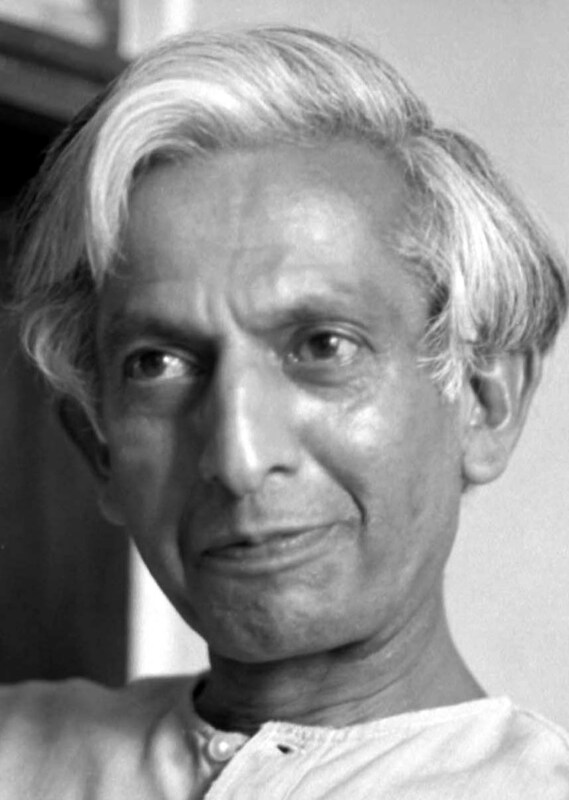 How did your methods of pedagogy evolve over your forty years at JNU? What insights could you impart to others striving to do their very best for their students? Yes teaching has been a passion, and I have always felt that meaningful research has to go along with engaged teaching. I love the dynamic communicative context of the classroom, I find it energising and enormously stimulating. JNU has been a very special institution. The admission policy we had devised – unfortunately it is being dismantled now – enabled students from diverse backgrounds – social, cultural, economic – to join the university. We had an amazing mix of students from different classes, castes, genders, and regions. They came with enormously varying linguistic and academic competencies. So teaching was challenging. 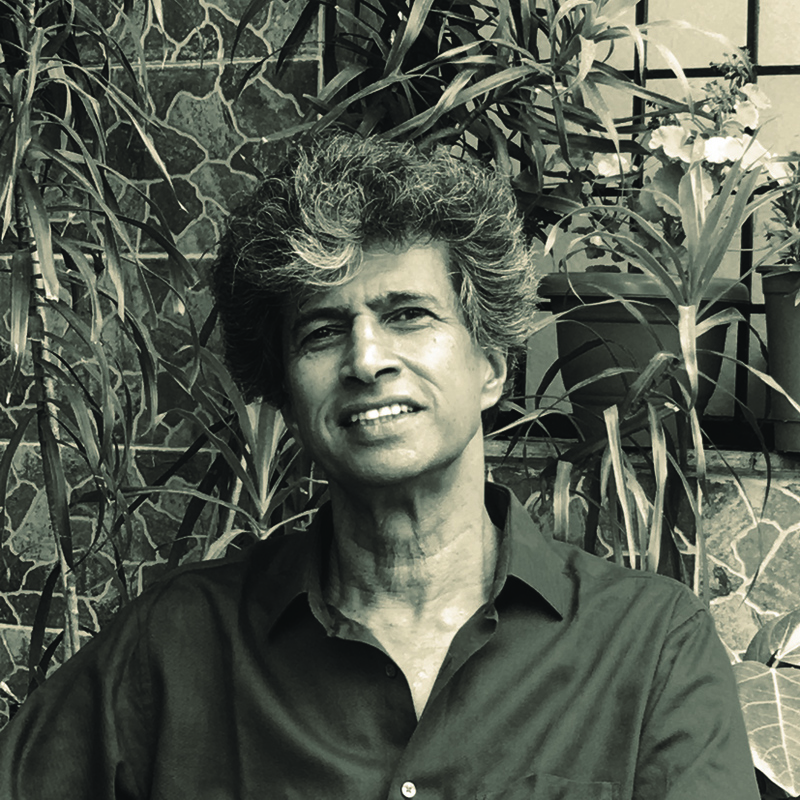 To teach in JNU I had to learn quickly that it was not enough to be eloquent and knowledgeable – it was important to get across to all the very diverse kinds of students we had there. It was necessary for me to try making sure that every level of student understood what I was saying. Also, there isn’t much point if students find a lecture impressive but are unclear about the argument and remain untouched by what is said. As a teacher, one needs to be sensitive to what they cannot understand and why. This requires empathy: a desire to know the problems of different students and recognise that everyone learns in dissimilar ways; they have different proficiencies. When students come armed with vastly different levels of knowledge, and with linguistic and analytic competencies that differ widely, the critical challenge is to try reaching them all – neither making some feel you are talking above them, nor allowing the attention of others to flag. Over the years I felt it necessary to articulate ideas in different ways, at different levels of simplicity and complexity, building arguments in a form where the most complex idea becomes comprehensible to all: so that what is difficult does not appear to be so. As an aside, I might add that in writing this book I was conscious of the need to move at these different levels and was grateful that my editor, an old friend, at times demanded that I explain myself, at other times wanted me to tighten an argument that was over-elaborate. In conducting discussions – whether over tutorials or in seminars or with an editor – every teacher and writer develops a preferred personal style. I can only mention some of the pedagogic problems I have tried to grapple with. Some of them are general pedagogic issues: How best to draw out the ideas a student is attempting to formulate – ideas that are at times inchoate, waiting to be developed; how to help a student think through his or her ideas, see the possible problems within them, the criticisms they may be subject to – that is, how to encourage students to critically engage with the arguments not only of others but their own. Given the social diversity of JNU’s students that I mentioned earlier, the question for me was: how do I critique without demoralising, how do I discover what is worth appreciating even in presentations that are initially not clearly formulated; how do I nurture a dialogic context in which the self-confident and the articulate do not silence those who are reticent and full of self-doubt. Finally, I note your poignant dedication of the book “to JNU, as it was”. You have had an uninterrupted view of JNU from within, over forty years. It would be marvellous if you could write at some length about JNU “as it was”, to produce one kind of fragmentary source for a future generation of historians seeking to research the history of India’s universities in the late twentieth century. I do not think I can speak in any detail about JNU within the space of this interview. But let me explain the dedication. My dedication is part celebration, part nostalgia. It is a celebration of what JNU had come to embody, what it stood for. It is nostalgia for that intellectually and politically vibrant space that is now under attack. Part of this nostalgia is to do with my own personal connection with JNU. The MA courses in JNU started in 1972, I joined as a student a year later, and between 1976 and 2017 I was teaching there. I have seen an arid landscape – a scrubland of the lower Aravallis – being transformed into one of the greenest belts of New Delhi. I have seen the university structures come up: the school buildings, the hostels, the dhabas, the shopping complexes, the stadium, the auditoriums, the nurseries and gardens. 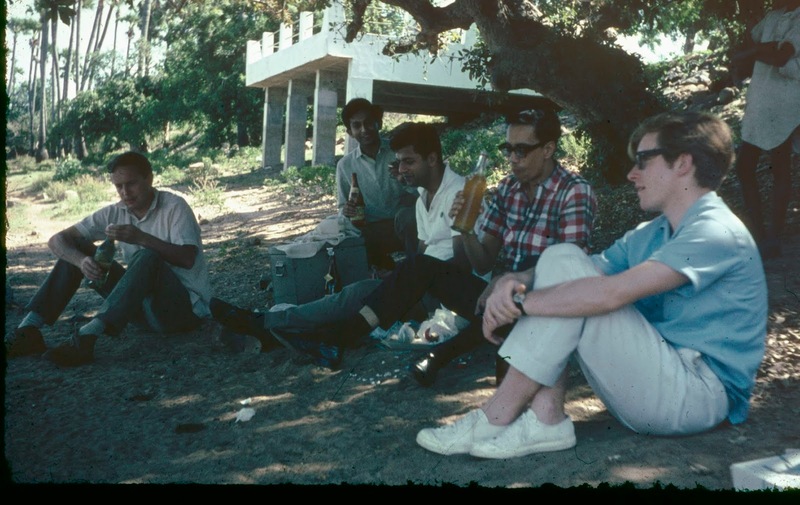 As students we worked till late in the library, moved to the dhabas for tea, spent long hours discussing the state of the world or the inner logic of different theories, and walked up the rocks romancing and socialising. We attended political meetings, heard great lectures, organised study groups, and participated in intense discussions on diverse issues. JNU was a fun place where learning was joyous, and where the academic and the political fused seamlessly, where to be intellectual was not to be anti-political. Learning to reflect was also to think about the world politically. Knowledge had to open up a vision of the future, make us aware of the world we inhabit. We learnt from our great teachers, but we also learnt a lot outside the classrooms. The institutional structures of JNU developed over the years through debates and discussions, struggles and negotiations. These structures were to fecilitate collective discussion between different departments and schools, and between teachers, students, and administrators. Courses were discussed and norms of functioning debated within these institutional structures. Within them teachers and students had a voice in defining the shape of intellectual and institutional life in the campus. The unique admissions policy that was developed was the product of students’ struggles and prolonged discussions at different levels. It is the admissions policy, as I said, that defined one of the most remarkable characteristics of JNU. Since 20 per cent weightage was given for economic and regional backwardness, we could draw students from different social, regional, and linguistic backgrounds, even before the statutory reservation policy came into effect. JNU became a polyglot, multicultural, and socially diverse space. For students, living within such a space was itself a learning experience. In interacting with each other they learnt about cultural and social diversity, and about the meaning of deprivation. For most teachers, teaching this diverse social body was both exciting and challenging. It takes long to build an institution and very little time to destroy one. Over the last few years, democratic structures established through discussion and struggle have been rapidly dismantled. Meetings of statutory bodies – Boards of Studies and Academic Councils – are not regularly held, and when held discussions are disallowed and minutes manipulated. Selection boards to appoint teachers are now packed with people who are not part of approved panels of experts. All the established norms and conventions are being violated, teaching is being policed, political discussions disallowed, and students and teachers who protest are being targeted. Spaces of social and intellectual interaction – the iconic dhabas of JNU – are being closed down. With all its problems, JNU was a happy and exciting place over the time I lived and learned and taught there. It has been now transformed into a sort of war zone. Teachers and students are engaged in an everyday battle to save the university, staging demonstrations, holding protest meetings, filing court cases. Even those who have never directly participated in politics in the past now see the need to speak up, write, protest. I hope something of the past will survive because of this amazing struggle that is now going on, and that something positive will emerge from the current chaos. I am an optimist, but for the moment I cannot envisage, leave alone write, a script entitled JNU “as it will be”. 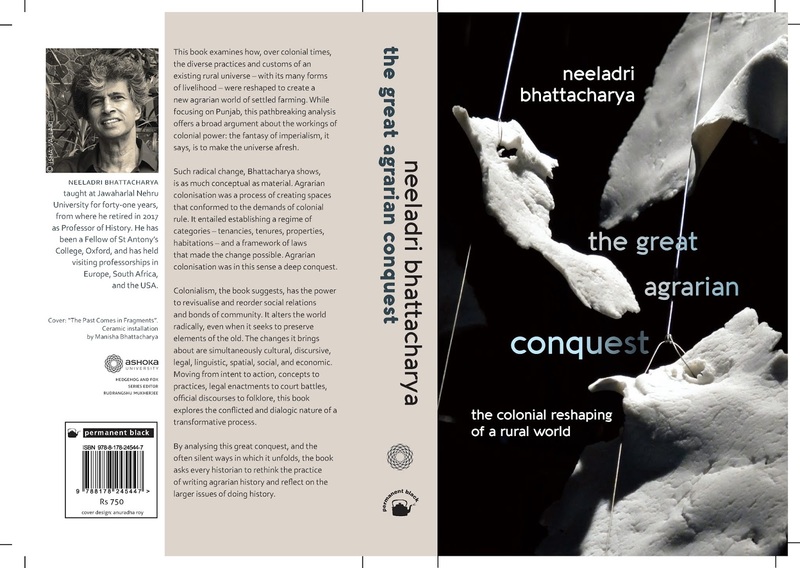 This book examines how, over colonial times, the diverse practices and customs of an existing rural universe – with its many forms of livelihood – were reshaped to create a new agrarian world of settled farming. While focusing on Punjab, this pathbreaking analysis offers a broad argument about the workings of colonial power: the fantasy of imperialism, it says, is to make the universe afresh. Such radical change, Bhattacharya shows, is as much conceptual as material. Agrarian colonisation was a process of creating spaces that conformed to the demands of colonial rule. It entailed establishing a regime of categories – tenancies, tenures, properties, habitations – and a framework of laws that made the change possible. Agrarian colonisation was in this sense a deep conquest. Colonialism, the book suggests, has the power to revisualise and reorder social relations and bonds of community. It alters the world radically, even when it seeks to preserve elements of the old. The changes it brings about are simultaneously cultural, discursive, legal, linguistic, spatial, social, and economic. Moving from intent to action, concepts to practices, legal enactments to court battles, official discourses to folklore, this book explores the conflicted and dialogic nature of a transformative process. "The Great Agrarian Conquest is at once deeply theoretical as well as solidly empirical. 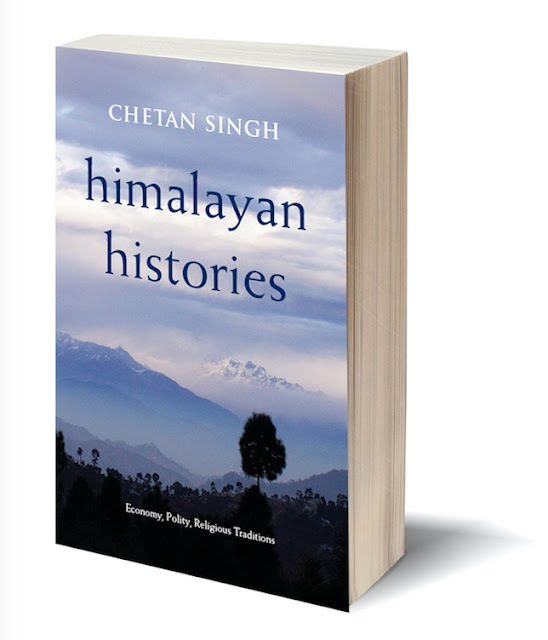 It elegantly bridges different fields and approaches generally treated in a segmented manner by less accomplished (or less ambitious) historians. It integrates texts with contexts, discursive practices with material reality. This is a history of ideas and of institutions, of livelihood practices and of everyday social relations. It investigates both structure and agency, the reshaping of rural Punjab by a colonial ideology of codification and improvement as well as the actions of individual officials which were often at variance with each other. taught at Jawaharlal Nehru University for forty-one years, from where he retired in 2017 as Professor of History. He has been a Fellow of St Antony’s College, Oxford, and has held visiting professorships in Europe, South Africa, and the USA. There is so much happening in January we don't know where to start. For one thing, Delhi has a bookfair on. And while we know it's chilly and grey and there are a hundred things to do, we promise that stepping into the halls of the bookfair will make the most jaded souls feel like children. 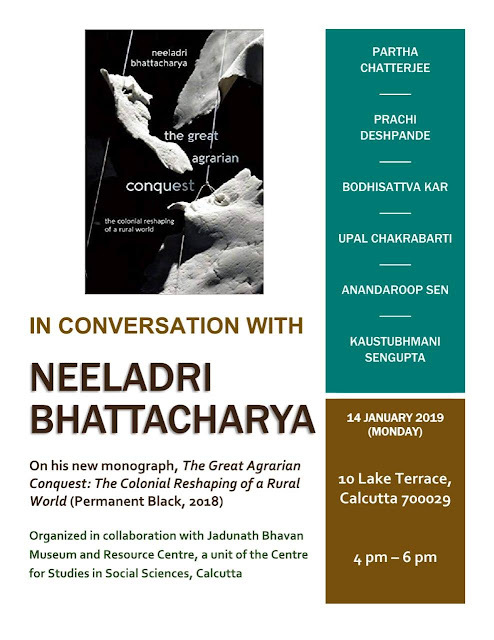 Next up, Neeladri Bhattacharya is in conversation with a galaxy of star scholars about his new book. This event will take place in Calcutta on 14th January 2019. It may be worth travelling there for it, combining the trip with a few of Calcutta's winter treats -- notun gur shondesh, balmy walks on the Strand, breakfast at Flury's, boatrides on the Hooghly, and the standard pollution levels of all our big cities. 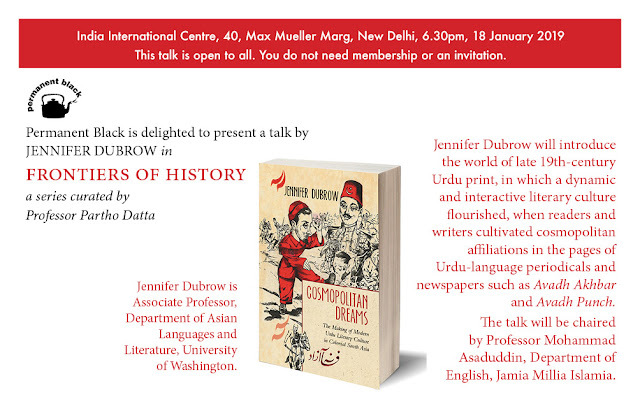 On the 18th of January, Jennifer Dubrow will be at the India International Centre, Delhi, speaking in the prestigious Frontiers in History Series. 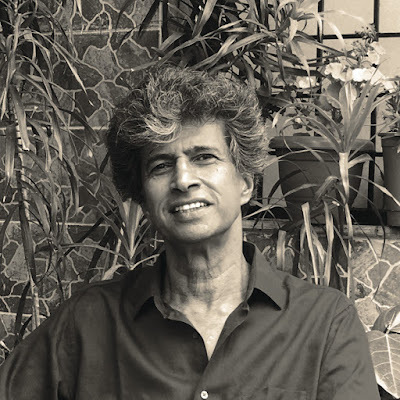 This series of talks, curated from its inception by Jawaharlal Nehru University Professor Partho Datta, has featured some of the best writers and scholars at work today in fields as diverse as history, music, design, even the army. Jennifer Dubrow will be speaking on lots of lively things, ladling out a spot of Avadh Punch to beat the cold. In late-nineteenth-century South Asia, the arrival of print fostered a dynamic and interactive literary culture. There, within the pages of Urdu-language periodicals and newspapers, readers found a public sphere that not only catered to their interests but encouraged their reactions to featured content. Cosmopolitan Dreams brings this culture to light, showing how literature became a site in which modern daily life could be portrayed and satirized, the protocols of modernity challenged, and new futures imagined. 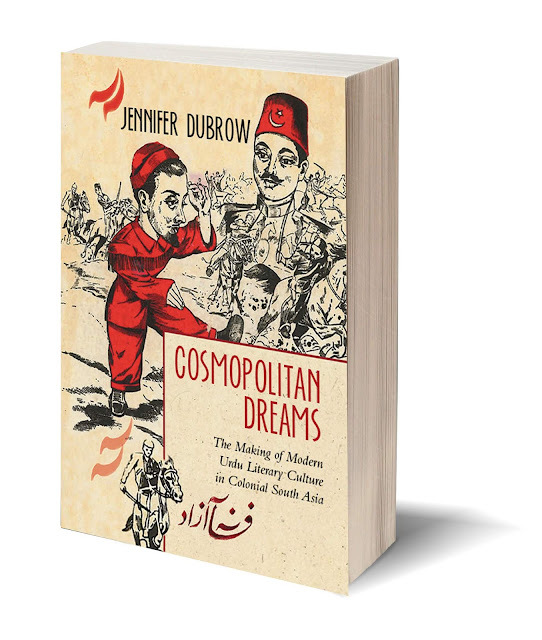 Drawing on never-before-translated Urdu fiction and prose and focusing on the novel and satire, Jennifer Dubrow shows that modern Urdu literature was defined by its practice of self-critique and parody. Urdu writers resisted the cultural models offered by colonialism, creating instead a global community of imagination in which literary models could freely circulate and be readapted, mixed, and drawn upon to develop alternative lines of thinking. Highlighting the participation of readers and writers from diverse social and religious backgrounds, the book reveals an Urdu cosmopolis where lively debates thrived in newspapers, literary journals, and letters to the editor. Arguing against current understandings of Urdu as an exclusively Muslim language, Dubrow demonstrates that in the late nineteenth century Urdu was a cosmopolitan language spoken by a transregional, transnational community that eschewed identities of religion, caste, and class. The Urdu cosmopolis pictured here was soon fractured by the forces of nationalism and communalism. Even so, Dubrow establishes the persistence of Urdu cosmopolitanism into the present and shows that Urdu’s strong tradition as a language of secular, critical modernity continues to flourish in film, television, and online. 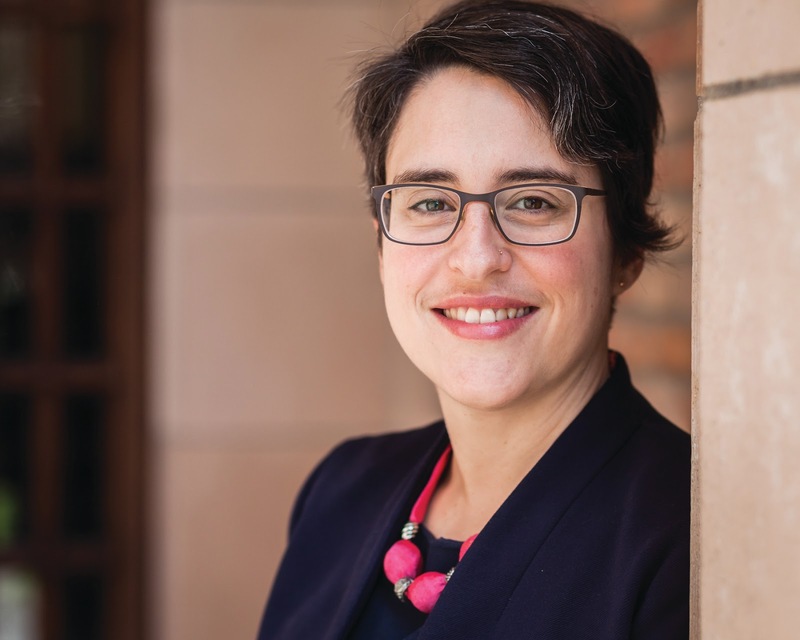 Jennifer Dubrow is assistant professor in the Department of Asian Languages and Literatures at the University of Washington. This volume looks at the early Indian novel in a comparative frame, in the light of new conceptual approaches and research. It looks at novels written in various Indian languages as well as English. This is not a chronological or comprehensive history of the Indian novel, but a book about the connections between the novel in India as an emerging genre in relation to discourses such as political writing, visual culture, popular print genres, law and ethnography. A wide-ranging examination of the early Indian novel of the kind to be found here has not been attempted before. 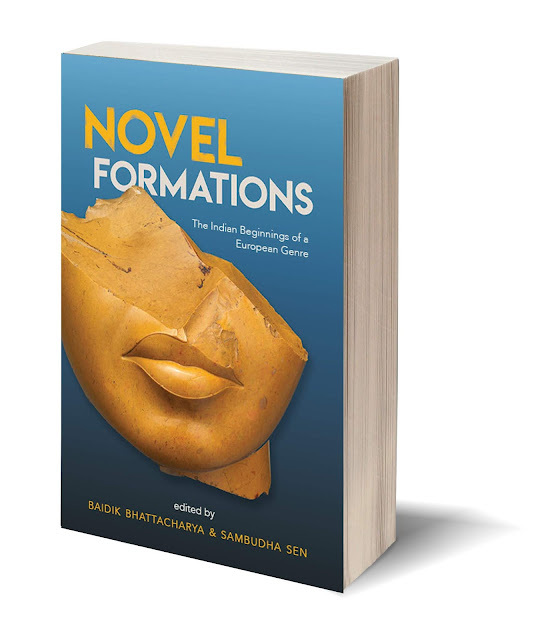 This volume breaks new ground in the scholarship on the novel both in India and Europe. It will contribute to discussions on cultural modernity, the emergence of public spheres, and the history of expressive resources and literary languages in modern India. Baidik Bhattacharya is Assistant Professor of English at the University of Delhi. He is the author of Postcolonial Writing in the Era of World Literature: Texts, Territories, Globalizations (2018), and co-editor of The Postcolonial Gramsci (2012). His essays have appeared in Critical Inquiry, New Literary History, Boundary 2, Interventions, and Postcolonial Studies among other places. He serves on the editorial board of the journal Postcolonial Studies. 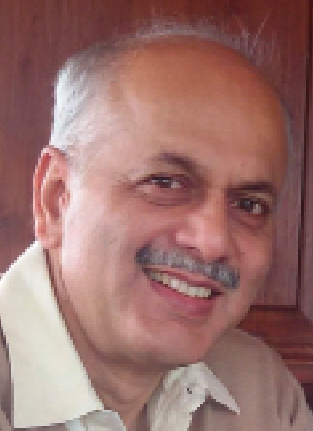 Sambudha Sen is Professor of English, Shiv Nadar University, Uttar Pradesh. He has published essays on the print and visual culture of Victorian England in Representations, Victorian Studies, English Literary History, and Nineteenth Century Literature. He is the author of Dickens’s Novels in the Age of Improvement (Manohar, 2003), and London: Radical Culture and the Making of the Dickensian Aesthetic (Ohio State University Press, 2013). He is currently researching the ways in which contagion was understood in nineteenth-century England, especially in relation to the poor. He is also beginning a project on the development of English literary prose in India. How did states come to monopolize control over migration? What do the processes that produced this monopoly tell us about the modern state? 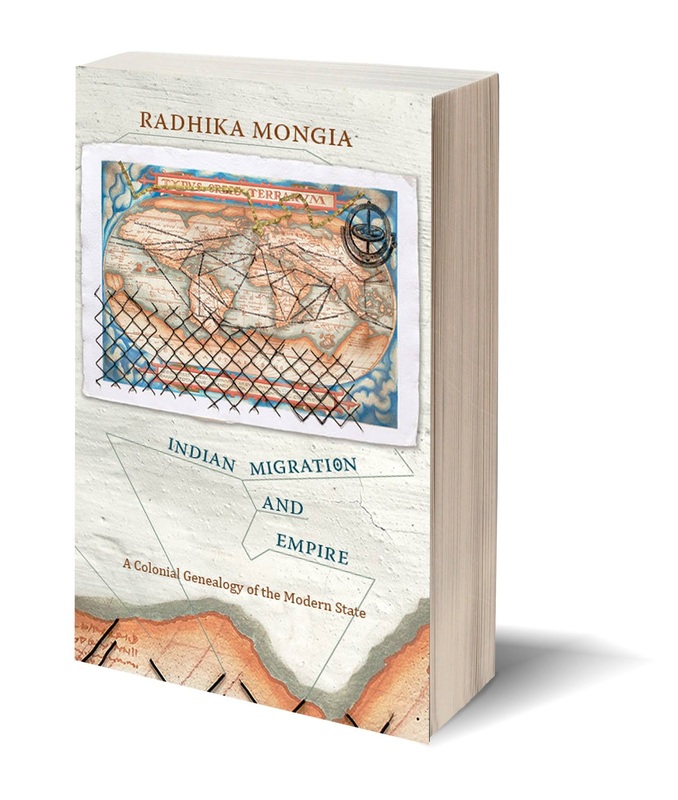 In Indian Migration and Empire Radhika Mongia provocatively argues that the formation of colonial migration regulations was dependent upon, accompanied by, and generative of profound changes in normative conceptions of the modern state. Focused on state regulation of colonial Indian migration between 1834 and 1917, Mongia illuminates the genesis of central techniques of migration control. She shows how important elements of current migration regimes, including the notion of state sovereignty as embodying the authority to control migration, the distinction between free and forced migration, the emergence of passports, the formation of migration bureaucracies, and the incorporation of kinship relations into migration logics, are the product of complex debates that attended colonial migrations. By charting how state control of migration was critical to the transformation of a world dominated by empire-states into a world dominated by nation-states, Mongia challenges positions that posit a stark distinction between the colonial state and the modern state to trace aspects of their entanglements. RADHIKA MONGIA is Associate Professor of Sociology and faculty in the Graduate Programs of Sociology, Political Science, Gender, Feminist and Women’s Studies, and Social and Political Thought at York University, Toronto.